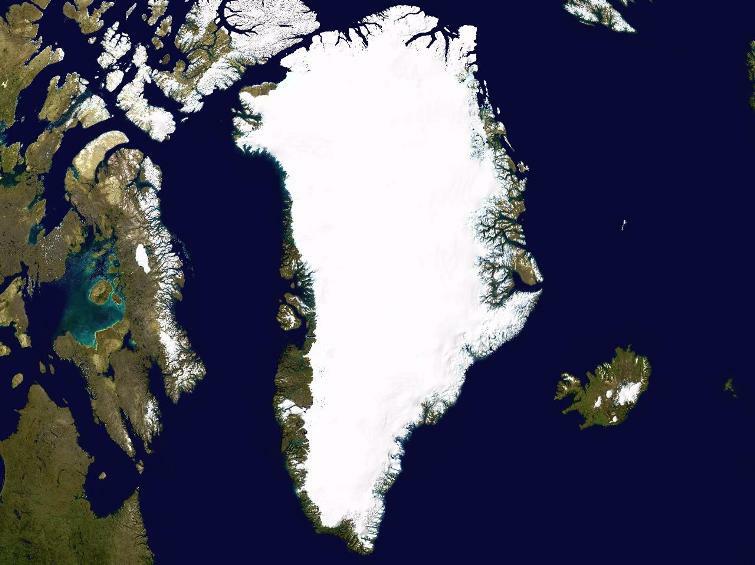 Greenland, the world's largest island, is about 80% ice capped. Vikings reached the island in the 10th century from Iceland; Danish colonization began in the 18th century, and Greenland was made an integral part of Denmark in 1953. It joined the European Community (now the EU) with Denmark in 1973 but withdrew in 1985 over a dispute centered on stringent fishing quotas. Greenland was granted self-government in 1979 by the Danish parliament; the law went into effect the following year. Greenland voted in favor of increased self-rule in November 2008 and acquired greater responsibility for internal affairs in June 2009. Denmark, however, continues to exercise control of Greenland's foreign affairs, security, and financial policy in consultation with Greenland's Home Rule Government. The climate in Greenland is extremely harsh. More than 80% of the island is covered by an ice cap which is 4km thick in places. Many of the Eskimo (Inuit) people survive by hunting and fishing and are struggling as fish stocks become depleted. The island's population is only 57,000. The capital of Greenland is Nuuk. It is also the largest city of Greenland. University of Greenland is located at the capital city and Air Greenland offers regular flight service to Nuuk Airport. 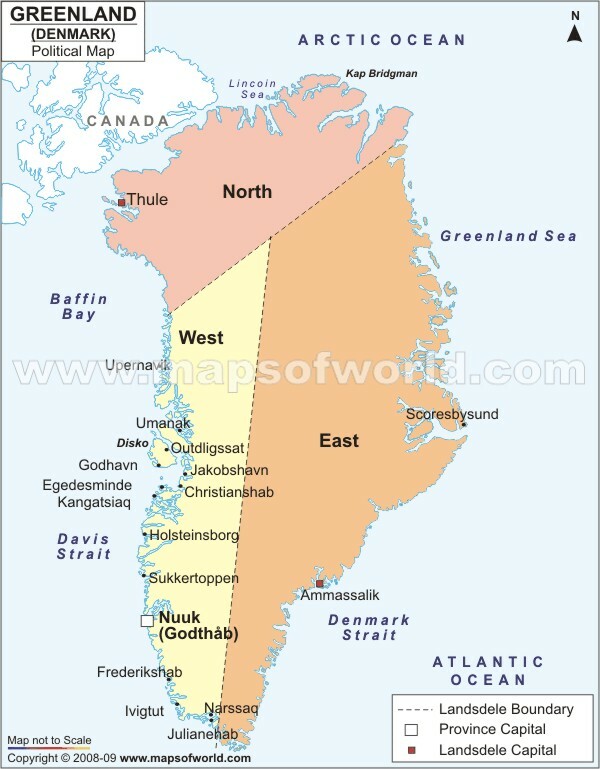 Cities in Greenland fall under different regions which are divided on the basis of population of that area. The cities vary in their importance and features. Most densely populated, and comprising the municipalities of Paamiut, Nuuk, Maniitsoq, Kangaatsiaq and Sisimiut, this region forms the financial hub of the country. The capital of Greenland, Nuuk is home Landstinget, the home rule administration and institutions of higher education. The headquarters of the country's banks and most of the major companies are present in Nuuk. Nuuk also forms the most important port in Greenland. Sisimiut, the second largest city of Greenland comprises a large number of commercial enterprises. The most important industry of Greenland, the fishing industry is located in Sisimiut. It has the Greenland's largest fish factory which is one of the most upgraded plants in the world. Made up of the municipalities of Aasiaat, Qasigiannguit, Qeqertarsuaq and Ilulissat this region consists of a quarter of Greenland's population. The third largest town of Greenland, Ilulissat is the commercial center of the Northern Greenland. Fishing being the primary occupation, the town has several local fish factories. Many companies have also come up in this town due to its economic development. Commercially underdeveloped, this area has the municipalities of Uummannaq, Upernavik, Qaanaaq, Ammassalik and Ittoqqortoormiit. 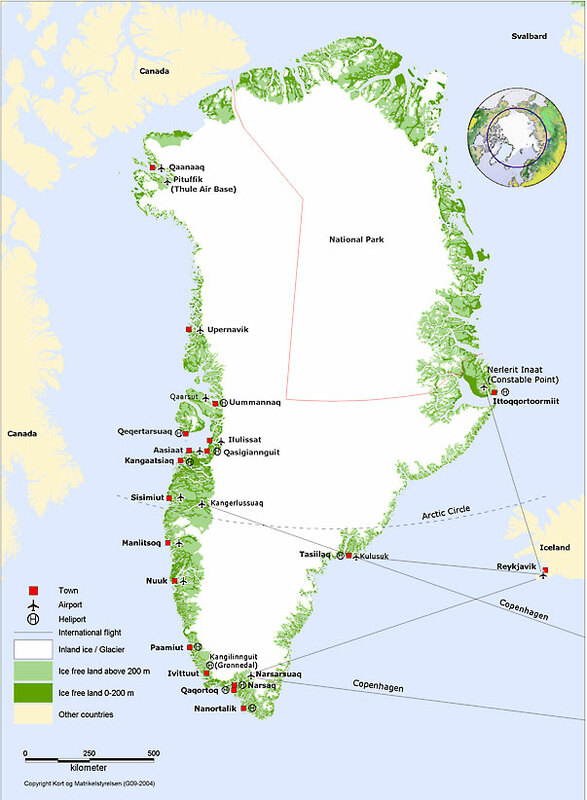 20% of Greenland populations who live in this area depend on marine mammals and fishing. Municipalities of Nanortalik, Qaqortoq and Narsaq lie in this region. Agriculture, fishing, sheep farming and gold mining form the major occupational activities of this region. The fourth largest town in Greenland, Qaqortoq is also the largest in the southern region. Acting as the financial center of this region, it contains a large fishing fleet and a fish factory. Recent environmental studies have raised fears that global warming is causing Greenland's ice cover to melt increasingly fast and that this could have serious implications for future sea levels and ocean currents unless the process is rapidly halted and then reversed. 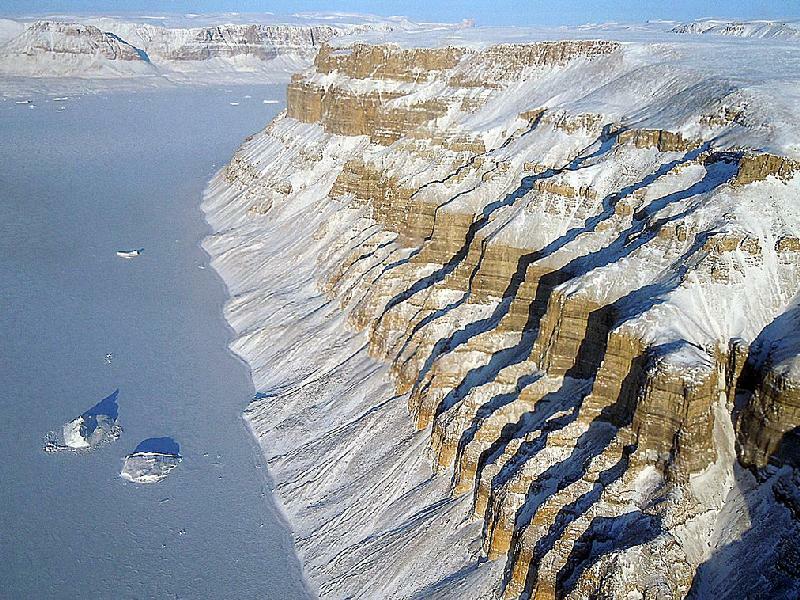 The response of the Greenland Ice Sheet to a changing climate is complex. It depends on the interactions between the ice sheet, the atmosphere, and the ocean. Only recently have complex mathematical models been developed that describe this system as a whole and this has improved our ability to model the natural system as a whole. Improving estimates of the balance at the ice sheet surface, now and in the future, relies on being able to downscale regional atmospheric models and to understand the processes controlling the fast-fl owing ice streams. Additional uncertainties concern our understanding of the influence of melt water below significant parts of the Greenland Ice Sheet. It is important to remember that all models rely on assumptions and that as a result all model projections come with a level of uncertainty. Uncertainties tend to increase the further the projections extend into the future. However, as long as the uncertainties are properly understood, models provide perhaps the only tool currently available for predicting what the future will bring. Despite their limitations, it is clear from the mathematical models that the Greenland Ice Sheet is very sensitive to climate warming. 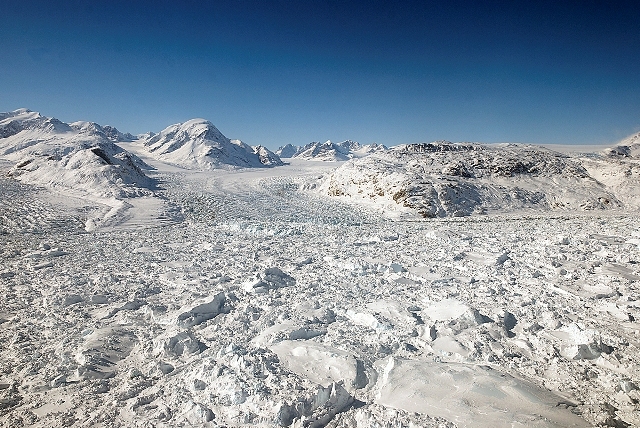 The Greenland Ice Sheet is losing mass in response to recent climate warming. Even if temperatures stabilize, the ice sheet will continue to melt for some time. Beyond a certain point the ice sheet may even enter a state of ‘irreversible destabilization’ leading to a complete melting of the ice sheet – as happened to the ice sheets that covered much of northern Europe and North America at the end of the last ice age. 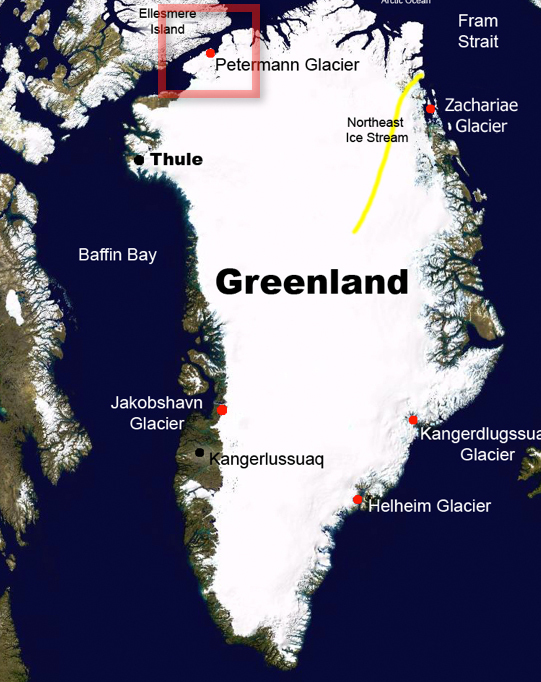 Under this scenario, Greenland would lose its ice sheet until such time as a new glaciation occurred. The surface warming at which the melting of the ice sheet would become ‘irreversible’ is a so-called ‘threshold’. 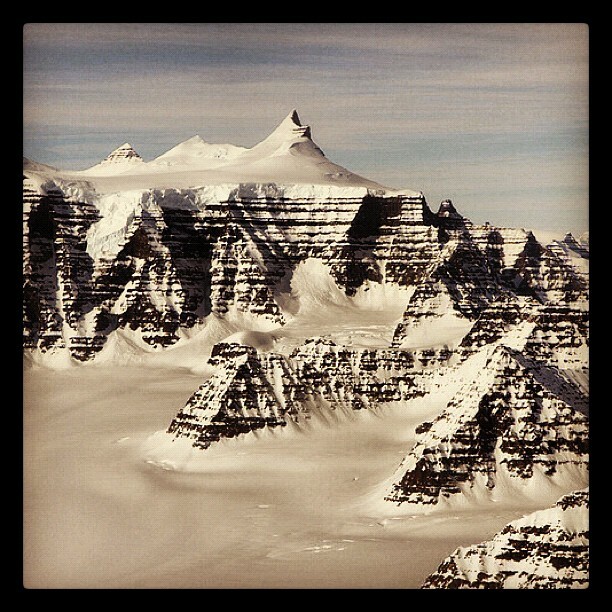 Northwest Greenland Canyons-On March 29, 2011, Operation IceBridge flew between deep canyons and over glaciers along the northwest coast of Greenland. IceBridge, now in its third year, makes annual campaigns in the Arctic and Antarctic where science flights monitor glaciers, ice sheets and sea ice. Some scientists believe that if the average global warming were to rise by 3.1 °C (corresponding to a warming over Greenland of 4.5 °C) thinning of the ice sheet would reinforce the decay of the ice sheet as a whole. Draw down of the ice sheet due to rapid glacial discharge would make it impossible to reverse the decline, even if temperatures were stabilized. Despite a lack of knowledge on the exact temperature rise that would constitute this threshold, it is agreed that well before the threshold is reached, the mass balance for the ice sheet as a whole would have started to decline – something that has already started during the 1990s and 2000s. In August 2010, the Petermann Glacier along the northwestern coast of Greenland calved an ice island roughly four times the size of Manhattan. 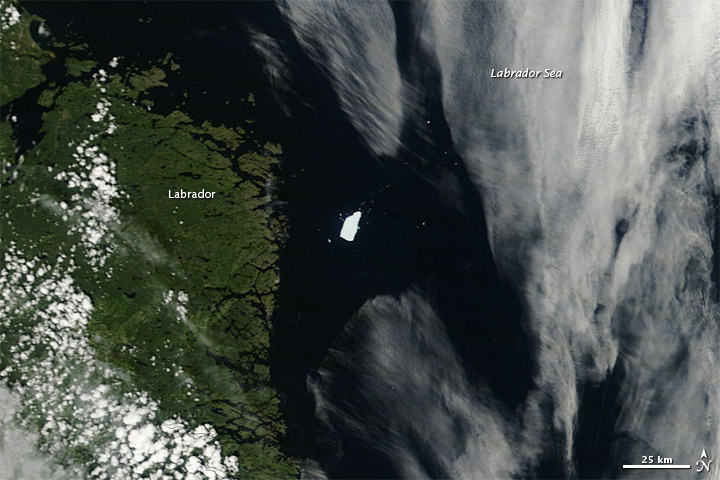 Nearly a year later, on July 20, 2011, a piece of that ice island—named Petermann Ice Island-A (PII-A) and about the same size as Manhattan—was still visible to the Moderate Resolution Imaging Spectroradiometer (MODIS) on NASA’s Terra satellite.